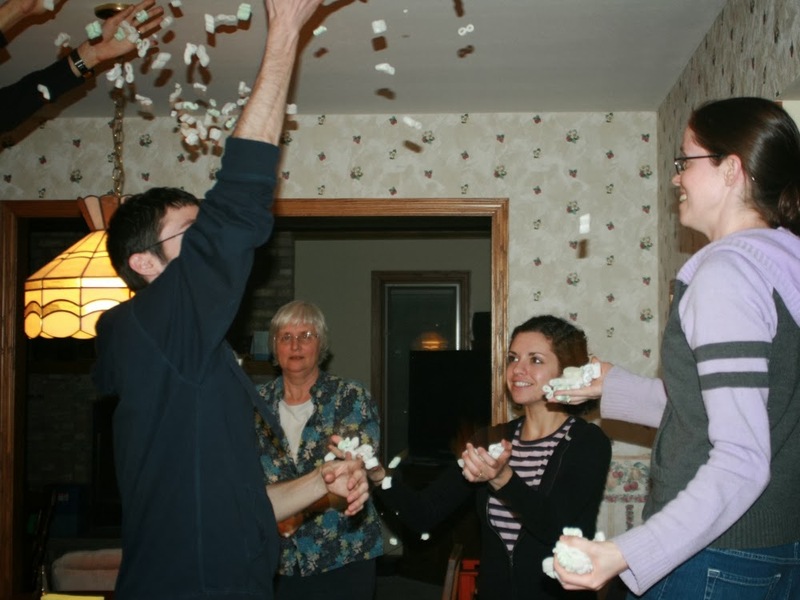 Celebrating a new game order by making it rain packing peanuts! I wouldn’t describe myself as being a member of the Cult of the New, a notorious title for people who like to play only the latest and greatest games. In fact, I’ve only played 9 games that were released this year and am still catching up on last year’s Essen catalog. However, I cherish the experience of playing a game for the first time (regardless of when it came out). There’s something about exploring the possibilities in a new game and marveling at an elegant design. Maybe it’s the excitement that comes with discovering a new mechanic, seeing a clever twist on your favorite formula, or immersing yourself in a new setting. Whatever it is, first plays are certainly memorable and after dozens or hundreds of plays chances are you’ll still remember that first time. Don’t get me wrong, I still love to explore the depth that comes with repeated plays but that first play is special. What got me thinking about this was my recent experience with a new-to-me game, Ginkgopolis. I remember following it on Board Game Geek for a while when it first came out and thinking that it looked pretty neat. Some reviews came out and I had a hard time wrapping my mind around what this game was all about. I didn’t really know what to make of it. After not seeing much play in my local game group it fell off my radar, briefly popping up every now and then when I saw it being played or heard it mentioned on a blog. Well, I finally got a chance to play it when a buddy told me how much he liked it and insisted that I give it a shot. Having been thoroughly perplexed by early reviews I didn’t have many expectations going in. But as my first game unfolded I remember being more and more impressed with it. There were so many moments during the game when I noticed something new and exciting and I was enthralled by the design. The way that the deck composition changes as you build new tiles which introduce new cards while old ones leave (in the form of tableau building) as their tiles get built over. How the board expands both up and out in a very organic way by rewarding players based on where they build. Or how drafting gives players enough restrictions to keep them focused but being able to use the cards in different ways and with a variety of tiles provides meaningful decisions. There’s much, much more that I was amazed by as the game progressed but by the end I remember thinking “that was really good!” I’m not just talking kind of good, I’m talking threatening-to-be-my-new-favorite-game good. Now, I have a couple of favorite games that would be pretty hard to replace but there was a time when I hadn’t played them yet and something else was sitting comfortably at the top. Maybe Ginkgopolis could be my new favorite game? Would I look back on this play fondly and remember all of those exciting moments? Reflecting on that game got me thinking about my current favorites and remembering the first time that I played them. Get ready for a trip down nostalgia lane with me, hopefully it will bring back memories of your first time with a favorite. A game of Race with my family. We’ll start at the top with my number one, Race For The Galaxy. This was back in 2008 when I was first getting into board games. I bought Puerto Rico based on its rating from BGG and then followed that up with San Juan to give me something more family friendly. San Juan was one of my first experiences with tableau building and I liked the concept but felt that it got a little bit repetitious after a while so I was looking around for something more varied. I had just started attending my first board game group and when I mentioned San Juan someone suggested the relatively new and hot Race For The Galaxy. Just look at all of those icons, those glorious icons! Each card was unique (almost) leading to what seemed like endless possibilities. You could sell your goods for points instead of just cash adding more variable strategies. And the big 6-cost cards gave you cool powers instead of just buckets of points encouraging you to play them sooner. It was everything that I had been looking for and instantly replaced San Juan. It was from the start, and still is, my most loved (and played) game. I would even go on to use it as a sort of litmus test for my wife on one of our first dates. I realize now that it’s not the best game to pull out to see whether someone will potentially share your gaming hobby but she painstakingly (and barely) made it through the rules explanation and first game. It has since become our game of choice and I remember specifically opening up each expansion and trying them out first with her. It has traveled the world with us and will always have a special place in our home. I’m a lucky man. 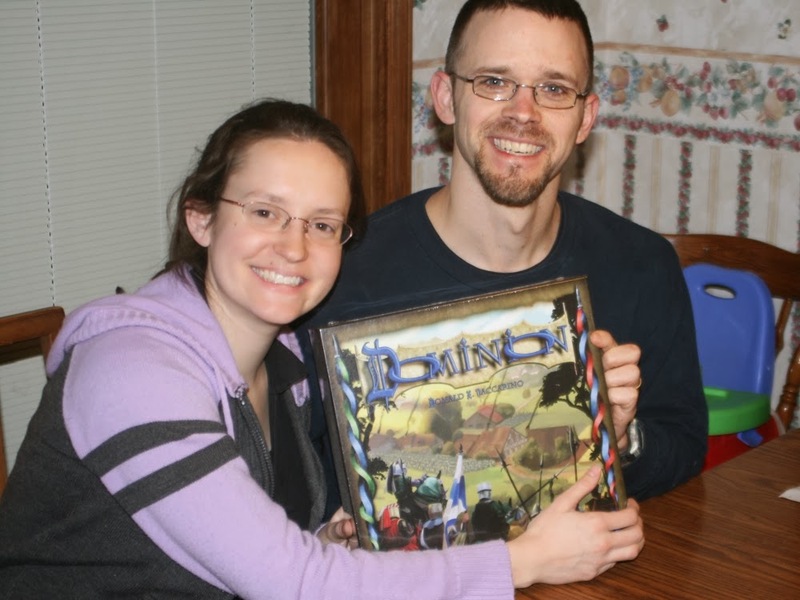 My sister and brother-in-law with their brand new game! Move along to Christmas and this newfangled deck building (whatever that means) game, Dominion, had just come out and people were talking it up. I got a copy of it as a present for my brother-in-law and after opening presents we decided to read through the rules and give it a try. I still remember trying to grasp the concept of what you were trying to do since it was a completely novel game concept. The A-B-C structure (Action-Buy-Cleanup) made the flow of the game easy to understand but we had no clue which cards were worth buying and when to start diving into the victory piles. We used the “First Game” suggested setup and I’m sure we emptied out the Village pile in true beginner’s fashion. If I play a Village I can play even more action cards? Oh yeah! Why would I ever buy a Silver? It was fun to discover the usefulness of different cards that didn’t seem very good (trashing, +Buy, treasures) and how much we were overvaluing others (+Action). Dominion remained one of those games that I cared way more about having fun and creating cool combos than winning for a long time. Fortunately when I decided to dedicate some effort to exploring the strategy I was pleasantly surprised by the game’s depth and replayability. Each Christmas we had a new expansion (or two) to unwrap and even now, seven Christmases later, it remains a family favorite! In 2009 I attended my first convention, IndyCon, a local one that was started by my game group and in it’s first year. With a glorious 2 and a half days of gaming in front of me I set out to discover as many new games as possible. It was here that I learned the hardships of running a farm and feeding your family in Agricola. It looked friendly enough so I wasn’t totally prepared for how tense and brutal it would be, there was so much to do and so little time to do it! The other players snatched away the good spots and my poor barren farm was hardly something to be proud of by the end of the game. But to my surprise I had enjoyed the tension of the game, the feeling that you were barely scraping by. It was intriguing and I was ready for some more, but next time I knew I could do better. Agricola opened up the world of tense games to me and paved the way for many more favorites like In The Year of the Dragon and Galaxy Trucker which beat you over the head and challenged you to come back for more punishment. I would even receive it later that year as a wedding present from some of my game group, thanks guys! 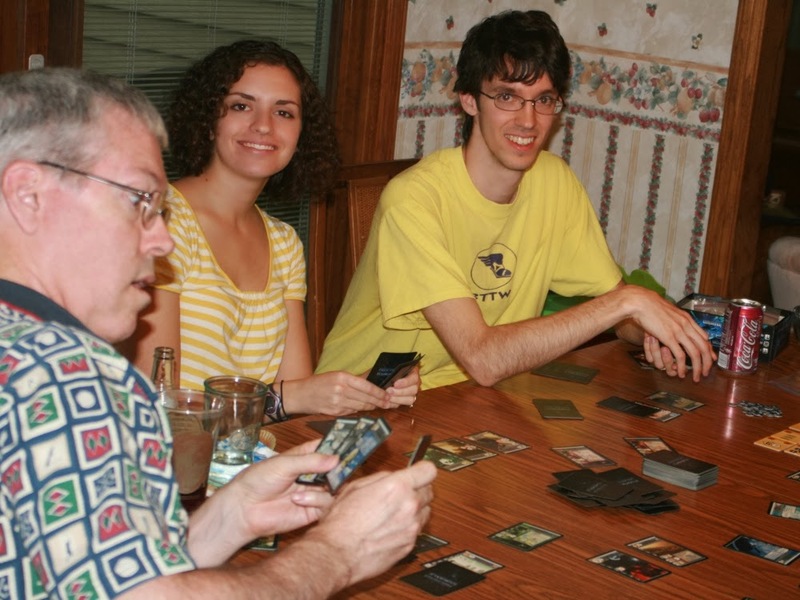 Later that year deck building had been gaining quite a bit of steam and it seemed everyone was jumping on board. I had tried out and liked Dominion and Thunderstone but was skeptical of the flood so I joined a game of newcomer Ascension with a bit of uncertainty despite the praise it was getting. It had a quick setup, I liked that. Maybe this wouldn’t be so bad after all? I had a short period of excitedly buying whatever looked neat from the center row. I’ll take some of this and some of that and he’s too expensive but maybe I’ll get him next time around! Then came a point where it seemed as though every good card that came out would get bought or killed before it came back to me. I was just randomly picking from the scraps and proceeded to get steamrolled. In short, it felt totally random and I didn’t like it one bit. So what happened that changed my mind? Frankly, I don’t quite remember why I gave it a second chance but I think despite having a miserable first game I still found Ascension intriguing and I felt a bit like a sore loser. I ended up getting it for Christmas that year and tried it out as a 2-player game instead of my initial game which had the full 4 players. Over the course of several games with my brother-in-law things started to click into place. The 2-player game gave you much better control over drafting from the center and I learned how to properly balance the two currency system. A couple plays later and it was my fast playing 2-player deck builder of choice! Those are just a few of my favorite memories but many more games in my collection have their own story from the first time that I played it. How about you? Do you remember that first time playing your favorite game? Maybe it was a magical moment or perhaps you hated it and only grudgingly revisited it only to learn how wrong you were. Chances are you have a story or two of your own to share. I’ll share two. The first is of Acquire. When I first moved to Illinois, I lived with three guys I hadn’t known before moving here. One of the ways they bonded was over games of Acquire, so I joined in a game when I was able. I was immediately taken with it, as I would find that I like stock games, but I didn’t grasp how money works in the game. There are two streams of income, and you need both: liquid assets (ca$h money) and strong investments. As one of my opponents would often say, “You have to diversify your portfolio.” Well, in that first game, I didn’t. I invested in companies that I thought would pay off big at the end of the game, but I didn’t have any money to buy new stocks during the game. I got trounced…but I also couldn’t be kept away. I’ve not played this one in a while, but I imagine I’d still love it. The second game is Dominion. J-Wolf and I had just discovered that we both liked board games, so we were bringing different stuff to try during our lunch hours at work. He brought Dominion, and it was love at first sight. I loved the combos, the CCG potential without the CCG buy-in. My first game I didn’t get the concept of trashing, really. I mean, I got it, but I didn’t see why anyone would want to do it. I also didn’t see why, if you had an extra buy, you WOULDN’T buy a copper. Needless to say, I lost that first game. But despite my rule not to buy games that other people in my play group own (it’s more a guideline, really…), I bought Dominion later that month. It’s probably my most played game, even if now I mostly play against AI opponents. Yeah, two for me, as well. One was playing Axis & Allies and other GameMasters games from MB. I’d play late into the night and into early the next morning with my buddies. We were Junior High and then High School (mostly before drivers licenses). Not only was it great fun to roll lots of dice and sweep across maps with plastic soldiers, but it led us check out all kinds of other war games. And while the game has aged for me, fond nostalgia of those times led me to check out board games later in life as my kids were getting older…and now I’m here! The other is with plain old traditional card games. One grandfather taught me pinochle and poker, the other set of grandparents taught me pitch, cribbage, and other staples. Cribbage was especially a favorite at family gatherings. So much smart play and back-and-forth for a game played with a deck of cards. But not so brain-burning that you can’t enjoy the company of your opponent. Best 2-player game ever.